e take for granted that fine art holds great value for us as individuals and for all cultures of the world. However, determining the hows and whys has always been an elusive task. On the one hand we have the aesthetic aspects that encompass beauty, symbolism, communication of ideas and a spiritual sensibility. On the other hand we have the commerce of distributing all the objects that contain these lofty attributes. In an ideal world commerce and aesthetics could be separated into two different sets of values that functioned independently from one another. But this is the real world, so art and business are forever joined at the hip. I offer a story of how one particular painting affected my life. 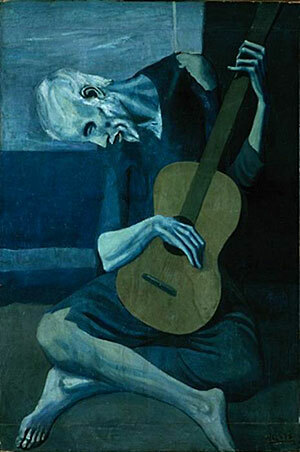 A 20-year-old Pablo Picasso painted "The Old Guitarist" during his Blue Period. A friend gave me a poster print of this painting when I was 20 during the time I call my Blue Period. I'd been playing the guitar for about five years and was starting to have fantasies about becoming a musician. I hung that poster in my apartment and felt the presence of the image every time I picked up my instrument to practice. The image of that old man in ragged clothes, hump-backed and hunched over his guitar, became a metaphor for my own toil and struggle. I had talent, but I wasn't gifted. After five more years of reaching for mastery of the instrument, I gave up playing and steered my life in a different direction. I put down my guitar, gave away that poster and suffered the pain that was the natural consequence of a shattered dream. Through the pain came the beginning of a lesson about the power and value of symbols and icons. A museum poster that probably only cost $30 became a defining element in my belief and understanding of who I was, what I wanted and the path of life I was traveling. That's when I started to understand the value of how a visual image can communicate such broad and deep meaning. When I gave up the guitar I couldn't give up my need for a place to put my passion. It seems natural that my passion migrated toward the visual arts. Giving up playing music meant letting go of a sizable part of what I thought was my identity. My search for a new sense of self played a major roll in pushing me toward the idea of collecting. 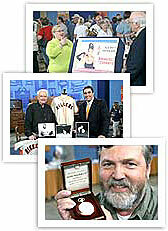 The "Antique Road Show" fantasy: hopes of skyrocketing value. In the beginning art seemed like a keen interest which evolved into an all-consuming passion. This kept me on a path toward a lifelong passion that became my personal salvation, a path with a dark side that offered me some vital lessons. For me, the money and business of art occupies a large part of that dark side. When I first started collecting, I was caught up in what I call the "Antique Road Show" fantasy: the idea of buying a piece for a little money just to watch its value skyrocket with the passage of time. After several decades of collecting I have come to view this get-rich obsession as a cultural perversion. This attitude draws attention away from the deeply personal meaning and aesthetic inherent in art. However, since I've never had much money, I've always obsessed over the price of art. There are standard guidelines and practices galleries use when pricing art. However, unless you are part of the process as a dealer, artist or collector, transparency is non-existent. The basic pricing guidelines focus on: 1) how successfully the artist has been promoted in the past; 2) how many shows the artist has been given; 3) what galleries the artist has shown in; and 4) the range of prices in their last successful show. Works by artists just beginning to show are given bargain-basement prices; this is the norm no matter how much time and effort the artist puts in, or how good the work might be. Artists have fantasies of striking the cultural mother lode of profit. Andy Warhol once said to an interviewer, "The greatest art is business." Warhol was arguably the supreme self-promoting artist of the 20th century. Of course, brokers and dealers are in it to make a living and the most successful are marketing geniuses. Museum directors and curators spend vast amounts of time and resources courting contributions from wealthy collectors and corporations. Blockbuster exhibitions underwritten by huge corporations and newspaper announcements of huge art donations from wealthy families stand as monuments to successful institutional promotion. The struggling, unknown artist just wants to eat and pay the rent. To outsiders these statements may seem brash, but these dealings are documented in detail by cultural historians like Alice Goldfarb Marquis. Her book, "The Art Biz," is the most enlightening and disillusioning book about the art world I have ever read. I strongly recommend it. The gallery from which I bought my first artwork made the sale because the gallery owner made an effort to make the pricing and sales process as transparent as possible. She gave me a short but thorough explanation on how galleries set prices. She explained that great art comes in all price ranges, as does mediocre art. That's when I started learning that the real value of art is not determined by the price on the sticker, but by the strength of the connection between the viewer and the object of interest. Money intertwines with the arts and culture business like blackberry vines in an untended garden. The fruit might be sweet, but the picking can be painful. It's easy to forget that even through a tangled mess, some flowers bloom above the thorns. So where are the blossoms among the thorns? Where is the value in buying original art? 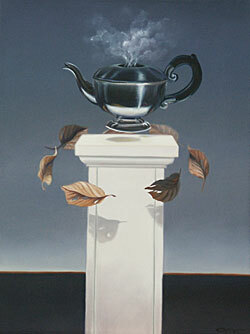 "Spiritual Awakening" from the private collection of Duane Snider and Linda Dies. E-mail Duane at sniderdies@msn.com and find more of his writing in our archives.